I was out on a Sunday morning run in the hills above the McKenzie Valley when a distant neighbor drove up asking if I knew of this dog, pointing to the shivering and scared black and white pup in the back of his pickup. I looked past the cab and her eyes stunned me. Of course I noticed her shivering – but mostly I noticed her piercing blue eyes. I told him I didn’t recognize her and after a few informational exchanges, I waved him off wishing he found her owners. Over the next hour of my run I couldn’t get her out of my mind, so I decided to check in and see what he had found. Much to my sadness, no one knew her and no one had claimed her. The Walterville Vet Clinic had microchip tested her and put her on Facebook as a lost dog. Our neighbor’s next move was to take her to the shelter, as he couldn’t keep her. I asked him if I could take over. I would continue trying to locate her owners and if I wasn’t able to keep her, then I would find her a home. 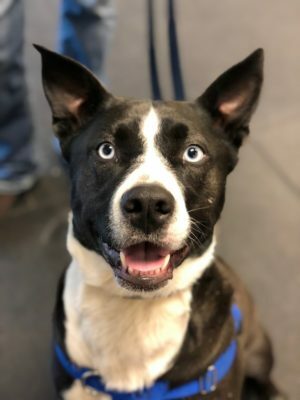 So up the hill I went to my boyfriend’s home with an excited black and white blue eyed dog – little did I know what I had gotten myself into! We spent 30 days trying to find who had lost her but we kept her during that time. Since we didn’t know her name, I tried Luna on her and she looked interested by that and it seemed to fit from the beginning. Luna was likely a dumped dog at the highway around the McKenzie River. She was scared and hungry. Eating was a voracious frenzy for the first month! I fed her 2 times a day as directed by our vet – but she always seemed unsure that another meal would come. She would scavenge the property trying to find creatures to kill and eat. I found her with a squirrel in her mouth on 2 occasions. I had no idea what I had just done taking in this dog. I truly had no business taking in a rescue (I have no dog skills!) – let alone a rescue who had been a dumped dog. As our trainer Jen would say the first day I met her, “you took on a Ferrari when really you could only handle a Volvo!” Dang, well said Jen…she was so right. We had been struggling along for over a year by the time I found Training Spot – so no matter what, I had to figure out this Ferrari! (Plus, I LOVED my Ferrari!) We were a team… as dysfunctional as we were, we were meant to be together. Before I found Jen and Carmalita at Training Spot, Luna and I struggled with most everything we came across; any other people she didn’t know as family, loud vehicles, other dogs (especially small dogs) scruffy people, bright colors like road crews wear, UPS or FedEx trucks – pretty much anything would send Luna over threshold. (Threshold – something we have learned in the past 2 months). Luna was always on the verge of being over threshold and as much as I loved her and nurtured her and tried ideas I read on the internet, we weren’t making much headway. Our walks more often than not ended in my being scared, frustrated and angry and Luna either being sad that I was upset or clueless that anything was wrong. Then I found Training Spot. In the past 3 months, I have learned so much about dog body language. I now understand when Luna is telling me something and I can respond in a way she understands. In December, I truly didn’t think it was possible we could make enough headway that would benefit both our lives. I see now that everything I am learning is changing our lives. We are in the beginning stages of being the “team” I had dreamt we could be. I know we have a lot more room to grow – (especially me, as she is super smart) but knowing that Luna is more confident every day and that she is showing confidence that I have her back is a dream come true. Thank you, Jen and Carm – Luna and I are so blessed. Teresa brought Luna Zack to us for multiple reactivity issues that included a large spectrum of triggers. From the moment we met, it was clear how much Teresa cared about this dog and was also in way over her head. That said, Teresa was dedicated to figuring out how to communicate and help Luna Zack find comfort in such a scary world. Working with Teresa and Luna Z was going to be a marathon, not a sprint…and Teresa was in 100%.